Up for sale is this lovely original botanical watercolor painting. There is a date written on the bottom that looks like it says Sept. 7th 1807. There is a very tiny tear to one of the outer margins and one of the bottom corners is missing a tiny piece. Up for sale is this lovely original Victorian Natural History watercolor painting of a bird with a pencil drawing background. The painting is mounted on a piece of paper; the painting's corners are inserted into slits in the paper. 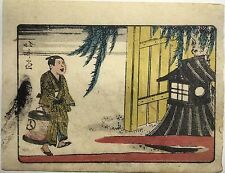 I have been told that the artist on this one is Hokusai. Condition is ok except for a big ink spot. Print size is 3.75 x 5.5. Original engraving is in excellent condition. Nice bright colors. No tears or creases in engraving. The print area is appx. 12" X 14". Photos have reflections from the glass. Original Victorian Color Lithograph Print Circa 1858 (Approx 160 Years old) - The Book of Orders of Knighthood and Decorations of Honour of All Nations. Antique print, 160 years old. Freshly double mounted, backed and sealed. Up for sale is this lovely original Victorian Natural History watercolor painting of 3 birds which look like pheasants with a pencil drawing background. I'm unsure of the exact date, but it is circa the 1800's. 1894 German Chromolithograph. Various CATTLE Breeds. CHROMOLITHOGRAPHY is a color lithograph produced by preparing a separate stone by hand. of producing color prints by individually hand painting engravings. JUNCTION OF THE GRETA & TEES AT ROKEBY. This 183 year old, hand-colored steel engraving print from a painting by J.M.W. Turner. It was published in New York by Appleton in 1834. The engraver was J. Cousen. Grand Duchy of Bavaria. 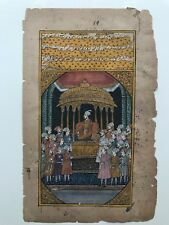 Original Victorian Color Lithograph Print Circa 1858 (Approx 160 Years old) - The Book of Orders of Knighthood and Decorations of Honour of All Nations. Antique print, 160 years old. OIL on CANVAS. This is a genuine painting. - The painting sold“AS IS". There are three holes on the canvas LATE 19 th - EARLY 20 th century. I use strong cardboard boxes and adequate padding material (bubble wrap and foam). 1910 Chromolithograph. What is a CHROMOLITHOGRAPH ?. CHROMOLITHOGRAPHY is a color lithograph produced by preparing a separate stone by hand. House Plants. of producing color prints by individually hand painting engravings. Up for sale is this lovely original foliage watercolor painting. The painting is circa about 1820. The painting is signed Elizabeth Porter. All in all a really beautiful antique botanical painting. 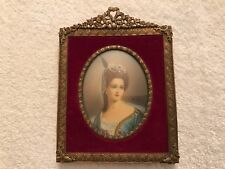 Victorian Era 1886 - Mini Oil Painting on Tin - 3" x 5 1/8"
Young Lady is dressed and has hairstyle appropriate & Iconic for Victorian Era. Picture # 2 & 3 show Brush Strokes Detail. Painting is Monogram signed LMN. Up for sale is this lovely original botanical watercolor painting. The painting is circa about 1820. The piece is signed, it was painted by S. Christopher Alderson. All in all a really beautiful antique botanical painting. Size : 12" 8" ( 30.5 cm. 20.5 cm. ). 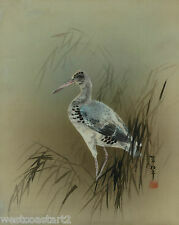 Up for sale is this lovely original Victorian Natural History watercolor painting of a song bird. The painting dates to around 1820. All in all a really beautiful original naturalist piece of artwork. Beautiful old book art Print : from theLife of Napoleon Bonaparte by William Milligan Sloane, Ph.D, L.H.D. Professor of history in Princeton University. Published by The Century Co. Reverse : Blank. This small, circular print has been hand embellished with paint on its surface in various areas. I included a picture of the side of the print to better understand its composition. (Braunsrhweig (27). Color chromolithograph. v. Gustav Leutzsch, Gera (Reuss). Eugen Köhler) Leipzig. Image Format 255 x 195 mm. Sheet size 330 x 270 mm. Condition: good. See photo.